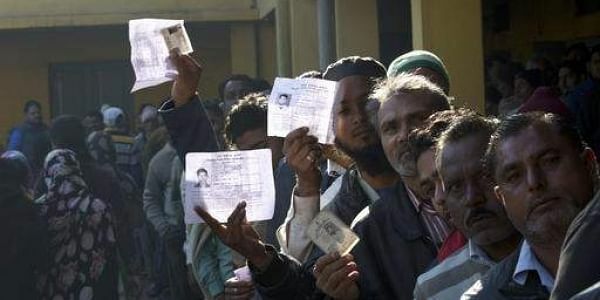 The polling for the byelection to Madhya Pradesh's Chitrakoot Assembly seat was underway since this morning with about 27 percent voters exercising their franchise in the first three hours. Bhopal, Nov 9 (PTI) The polling for the byelection to Madhya Pradesh's Chitrakoot Assembly seat was underway since this morning with about 27 per cent voters exercising their franchise in the first three hours, an official said. The voting started across the constituency at 8 am and around 27 per cent polling was recorded till 11 am, an official of the Election Commission (EC) said. Congress candidate Nilanshu Chaturvedi, BJP's nominee Shankar Dayal Tripathi and 10 others are in fray for the byelection in the Assembly segment, which lies bordering Uttar Pradesh. The BSP has not fielded its candidate in the bypoll. The byelection was necessitated following the death of Congress MLA Prem Singh (65) after a prolonged illness in May this year. He had won the Chitrakoot seat thrice -- in 1998, 2003 and 2013.